Submitted to NCVHS by Walgreen Co.
Michael J. Simko, RPh., Walgreen Co.
Good-Morning. My name is Michael Simko. I am the Corporate Manager of Pharmacy Health Information Technology for Walgreens. I have been a practicing pharmacist for 25 years. In addition, I am also the Co-Chair for NCPDP Work Group 11 – Eprescribing Standards. Speaking for the entire Walgreen Company, I want to thank the subcommittee for inviting us here to share the experiences, conclusions, and challenges that we encountered over the years from our continuous efforts to help deploy electronic prescribing connectivity nationwide, and improve the delivery of quality healthcare to patients. Walgreens, founded in 1901, currently has over 4,700 locations in 45 states and Puerto Rico. Walgreens fills over 1 million prescriptions daily, accounting for 14% of all retail prescriptions dispensed in the United States. We currently open a new pharmacy every day, actually every 17 hours. Nearly 30% of our pharmacy locations are open 24 hours. Our company focus is pharmacy. Walgreens has a long and successful history of pioneering technology in the practice of pharmacy. All of our pharmacies are linked by satellite. Walgreens is the greatest user of satellite communication in America outside of the U.S. government. Our mission is to provide the highest quality pharmacy services and quality healthcare to our patients in the most efficient cost beneficial manner. Walgreens has long recognized the benefits of Electronic Prescribing. Nearly 15 years ago, Walgreens initiated electronic communication between pharmacies and physician offices utilizing an e-mail like structure to message physicians for refill authorizations. Since that time, Walgreens developed the system and marketed eprescribing under the PreScribe™ trademark. The benefits of eprescribing, such as complete patient prescription information, elimination of transcription and communication errors became immediately apparent. However, to drive increased utilization of eprescribing by physicians there was a need for other pharmacy organizations to participate on a level playing field that guarantees the patient’s freedom of choice in selecting their pharmacy, and that messaging must flow through a secure means of communication. We sold PreScribe software to Proxymed, a network aggregator. Today, Walgreens communicates electronically in the sending of prescription renewal requests and receiving new medication orders from participating physicians. Walgreens’ electronic connectivity to physicians is primarily through network aggregators such as Proxymed and SureScripts. These connections are made through a secure private data circuit utilizing encrypted messaging and standards to prevent altering transactions. Prescribers are given authorized identification and certification before any access to the network. Agreements between trading partners ensure only authorized access to transmit and receive communications between pharmacies and participating prescribers. On the pharmacy side, existing firewalls and data encryption ensure the security and confidentiality of patient information. In addition, log files and audit trails exist. Access to patient information and system functionality enabled by sign-on/user ID to individuals with a valid authorization level. The benefits of improved exchange of healthcare information are well known. There is a critical need to protect privacy with improved discovery and delivery of patient’s medical records when they are needed, where they are needed, and only by authorized individuals who need them. The ability to locate patient records and deliver them securely will enable a number of improvements in healthcare, including the ability of authorized clinicians to access vital patient records in near real time in the event of an emergency, improving patient access to their own records, decrease the number of tests that need to be re-run because previous results cannot be found in a timely manner, lowering the risk of negative drug interactions, and safer delivery of medication orders to the pharmacy. Increasing the availability of information to authorized caregivers in a secure, accurate and timely fashion is essential to improve clinical care and provide a host of other benefits to the patient and the health system. 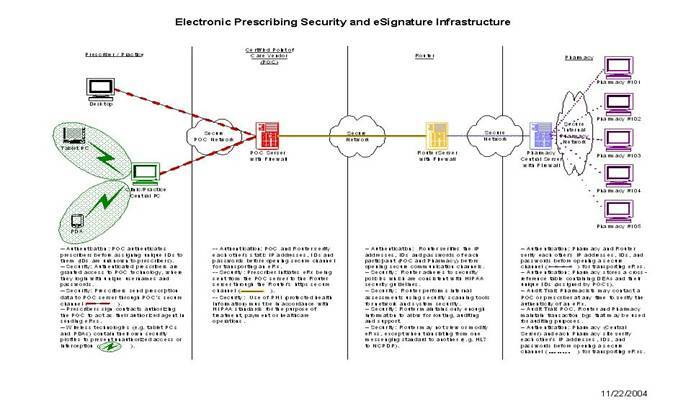 The connections between pharmacies and other entities must be secure utilizing SSL and VPN connections, private data circuits, and encrypted messaging. The continued better linking of patient records is essential to improving healthcare. There needs to be a method to correctly identify the correct patient records across many entities, labs, clinical systems, third party payers, and pharmacies. In order to effectively collect and transmit critical accurate data to support quality healthcare across various entities and properly link correct patient information may require a unique patient identifier. HIPAA compliance issues must be addressed to preserve and protect patient confidentiality. Each transaction is stamped with a system ID, sender, receiver, prescriber, DEA, and prescribing agent. All transactions are checked against network profiles. Transactions that fail authentication are rejected. The attached diagram shows the common architecture and infrastructure of the current messaging format. From the right – messages are sent to a central process at the prescribers practice – then routed through a secure connection to an aggregator – then sent to the pharmacy host system central server – from there dispersed to the correct target pharmacy. A challenge in moving forward with an effective system that allows the interoperability between authorized providers regarding a patients healthcare will be the authentication and level of information sharing. Indicators will need to be created and managed that adheres to HIPAA compliance standards allowing patients to authorize the movement and sharing of personal health information data among various entities. The dispersion of information between labs, prescriber systems, pharmacies and third party payers will need to be identified through standards development. Situations can and do arise where patients may selectively need to choose what information is shared and with what entities it can be shared. In today’s paper based world, patients will often use multiple pharmacies to avoid incorporating “sensitive” medical information with their overall profile. In addition, patients often at times, forego having a medication processed through their third party plan, opting to pay cash to avoid discovery of that medication information being identified or chance discovery by their employer. These may include categories of medication that treat mental health or a sensitive disease state. Patients today, at Walgreens, have the ability to “limit” their profile to a single store – not viewable by another Walgreen pharmacy. There is some reluctance in a significant patient population that resists sharing all information or being part of a mass data pool. Recent adoption of NCPDP standards regarding medication history and compliance messaging from the pharmacy to the physician create new opportunities and challenges for pharmacy as it relates to security and HIPAA compliance. Bi-directional messaging between pharmacies and physicians means the delivery of information the physician did not previously access regarding a patient. Because of the number of prescriptions not covered by third party plans, prescriptions that patients opted to pay cash, worker compensation prescriptions and OTC medications, pharmacies possess a greater amount of medication history than may be provided by a PBM. In addition, allergy and health condition information is routinely stored on host pharmacy systems. Pharmacies will need to address multiple types of data sets. The data sets needed to adjudicate claims for payment with payer groups do not need to contain the same level and type of information as data shared among prescribers and pharmacies. Clinical information will include different data fields and the extent of interoperable sharing of that information will need to be identified through standards and business partner agreements. The patient information system will need to be dynamic – allowing patients to participate in managing information flow – and give participating entities a mechanism to identify specific information for sharing while protecting other information. Patients may opt in for complete sharing of information or opt in only for selective data allowed for sharing. Preserving privacy is important to ensuring acceptance of the eprescribing and electronic medical records system along with its benefits. Patient health records should be left with the healthcare providers who created them. The architecture needed must support the linking of health records. The challenge to pharmacy is a unique patient and prescriber identifier system. The NCPDP provider ID is the current and standard process for enumeration and identification of pharmacies in use today, and has extensive industry experience. The NCPDP standards do support the use of the NPI. Adoption of NPI in e-prescribing should not be required until May 2007 deadline, if there is adequate industry experience in the use of the NPI and acceptable business practices are available for distribution of the NPI file to the industry. Until that time, the current identifiers should be supported. The e-prescribing industry will continue to use existing identifiers for business purposes that the NPI does not support, such as transaction routing to specific locations. To properly identify patients – unique identification methodology must be employed. Today, name and birthdate may identify patients – however, this may not be enough. Going forward, a Master Patient Index (MPI) may need to be created. There has already been success today in moving information across various standards. There is a current and successful effort within HL7 and NCPDP to interface the two systems to allow seamless movement of clinical information from one format to another. As this continues to develop and become implemented – more information about a particular patient will be available. Managing that information and ensuring HIPAA compliance procedures and patient confidentiality is protected. This will be a particular challenge to pharmacy as it deals with the assimilation of patient medication and health data from multiple providers. Furthermore, the growing challenge is the proper application and providing this information to other healthcare entities in a manner that does not violates the HIPAA standards or wishes of the patient. The COB (Coordination of Benefits) and SPOC (Single Point of Contact) efforts through CMS is another application of system integration that pharmacies will need to address as multiple payers and providers for patient healthcare are electronically aligned. Many challenges face pharmacy as eHealth Care continues to emerge. The protection and integration of patient information will need to be carefully addressed and evaluated to ensure the best of healthcare is provided while the protection of patient confidentiality is upheld. A large national database of patient information does not appear to be an answer. Patients are cautious of their health information being shared by entities that they do want to have access. Each provider entity should maintain their information and the interoperability of sharing that information will need to be included in provider agreements that include the patient’s intentions. Walgreens is profoundly appreciative of the opportunity to address these issues to the NCVHS subcommittee. We fully recognize the importance of this group’s efforts and are willing to provide any assistance to promote the adoption of eprescribing and resolution of any issues now and in the future.